Sturdy Luggage: I took this suggestion from my dad! He sells luggage so I asked him what piece of luggage he would suggest for others to get their dads for Father's Day. He said that the Rimowa Topas is the ultimate carry on luggage built with 100% aircraft aluminum which means it's extremely durable and crush resistant. It also has lockable clamps so it's super secure! P.S. I would trust my dad with luggage any day, he's literally worked with Cher. She also has Rimowa luggage. Be like Cher. Business Shirt: I feel like dads are always looking for clothes for work! Business shirts are always a classic gift that fits the bill of being practical and necessary. I love how put together the gingham button downs look, but always go with what your dad likes best! Nike Hoodie: Is your dad a fan of working out or just lounging around the house in comfy clothes? Then this hoodie is for you! My dad is a huge fan of their workout shirts and this hoodie is soft, cozy, and perfect for a variety of occasions. Although it's summer, this would be a great jacket for dads who love to jog in the morning when it's cool outside. Either way, it's a comfortable hoodie, and who doesn't enjoy having one in their closet? While you're at it, might as well buy him some nice sneakers to go along with it! Baseball Cap: Do all dads like baseball hats or is it just my dad? They're the perfect 'dad' accessory and come in such a great variety that there's something for everyone. Buy him one for his favorite sports team so the next time he goes to a game he can literally be decked out head to toe in gear. Or if you're in college stop by your school's student store and buy him one to cheer you on! Portable Grill: Has anyone else seen that craigslist ad that's been floating around Facebook lately about needing a "Stereotypical Dad" for a backyard barbecue? I thought it was hilarious, but so many of my friends related to the post and said their dads were exactly like the description. So I thought, what would a "Stereotypical Dad" nowadays have, and came up with the portable grill! How fun would these be to bring along on a camping trip or to a neighborhood party? Swim Trunks: Summer is here, and is your dad really taking the time to get himself a new pair of swim trunks? Do the work for him and buy him a nice fun pair for Father's Day. Pick out a few with fun colors or patterns and then go spend some time with him at the beach or the pool! Virtual Reality Headset: These headsets are all the rage right now. On the last plane I went on I sat next to a father who had one on the entire flight and was having a great time. I'm not exactly sure how these work, but everyone I know who has one seems to love them. Sugarfina Maple Bourbon Caramels: If you've never tried any of the candy from Sugarfina you are truly missing out. This stuff is heaven on earth and everything they make is purely delicious. These maple bourbon caramels sound incredible and if your dad has a sweet tooth, he's bound to love them. Shop all my picks below! these gifts are great for dad! This is such a great round up!! I am totally slacking on shopping for my dad and step-dad!! that portable grill is GENIUS!!!! Dad's are hard to buy for!! I'm doing an experience gift for mine this year but these are great ideas. Luggage is such a good idea! Love these picks! Guys are always so hard to shop for! Dads can be really tricky to buy for. This year I went with a pair of Nikes for my Dad, they're not all that different than the pair you featured! Such amazing choices. Really something for everyone! This guide is amazing!!! Mu husbs would want it all! Great round up of gifts for any guy! This is a great gift guide! You just gave me some great ideas! Such a great gift guide! I still haven't figured out what I'm getting for my dad so these are great suggestions! So many great ideas for dad! Love that portable grill! These are all fantastic ideas! I love the idea of getting swim trunks--I never thought of that and my dad definitely needs some new ones!! So many great gifts for dads! Love the luggage. These are some great ideas for dad, although I might want that coffee machine for myself. Such a great guide! Love the luggage especially! These are all such great gift ideas! My dad would love the portable grill! Love this list! Definitely the portable grill! Swim trunks are a great idea! 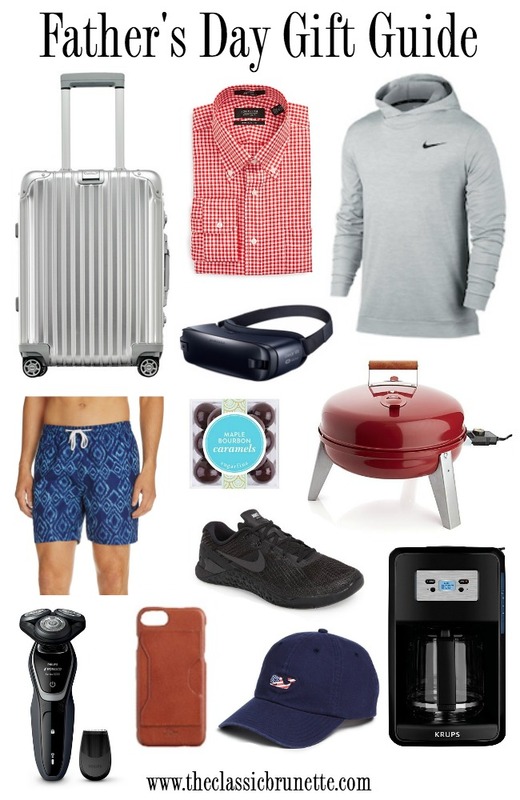 What a great list of Father's Day gift ideas! Such a great gift guide! I love all of your picks. Such a great gift guide! We always tend to grab the same thing for my dad, but this year we snagged him some sneakers and he was really excited (we already gave them to him). Shopping for dads is so much harder than moms in my opinion, but you've got some great suggestions here! I still have not tried anything from Sugarfina yet, but I know my husband would love the Maple Bourbon Caramels! Great gift ideas! That portable grill is neat! My dad would love that red button-down! This fathers day gift ideas are really very cool and interesting. I liked the VR Helmet, Shaver and Phone Case. I am surely going to follow your blog for other this kind of great ideas.